News just in from the Y.CO brokers as the 49.8m motor yacht Pestifer I has a further $1.5 million price reduction, following a similar price cut in September 2011. Conceived for a very discerning owner wishing to cruise with a small number of close friends, Pestifer I is most definitely an 'owner’s yacht'. Her designers, Paolo Scanu and François Zuretti, have not attempted to conform to the current dictates of the charter market, and the result is both refreshing and intimate. Completed to the highest possible specification, Pestifer I is full of pleasant surprises, both in her engineering and her interior finish. 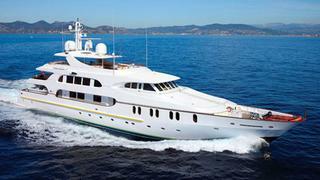 Pestifer I is now asking $12 million, down from $13.5 million.